Earlier this year I spent a few days at the Ronald Reagan UCLA Medical Center with my daughter who was having an EEG done. On our way home, I learned that there had been an outbreak of an antibiotic-resistant bacteria while we were there, that it had infected seven people and killed two of them. My daughter and I were fine – the infection having been limited to people using a particular kind of duodenoscope. When the story hit the news, I fully expected nationwide outcry similar to that inspired by the recent measles “epidemic” that began at Disneyland. That outbreak killed no-one, yet set the country on fire with calls for mandatory vaccination and even prison sentences for parents who choose not to vaccinate their children. Drug-resistant “superbugs” kill nearly 15,000 people a year in the US and a recent report predicts that they could kill as many as 300 million people by 2050. Surely this far more deadly health threat would lead to similar widespread outrage and calls for those even remotely responsible to be held accountable. I expected to see editorials calling for anyone who engaged in the overuse of antibiotics to be shunned by society; doctors who prescribed them unnecessarily (around 50% of all prescriptions by some estimates) to be censured and perhaps lose their licenses; parents who asked for antibiotics every time their child had an ear infection – despite the fact that the vast majority are not bacterial and are unaffected by antibiotics – to be thrown in jail for endangering the rest of us. But I saw nothing along these lines. Why not? The manipulation of the conversation around vaccines in the mainstream media has been nothing short of a tour de force. If you read only mainstream publications, you might come away with the impression that outbreaks of measles are the most serious public health crisis since the Black Death. You might think that those who do not vaccinate are uneducated, superstitious, “anti-science” zealots who get their information from daytime talk shows. You might even start to feel outrage at these people who – for no good reason at all – have decided to endanger everyone else by refusing to do what every doctor knows is perfectly safe, effective and the socially responsible thing to do. 1. Make it clear that parents who choose not to vaccinate their children are only getting their information from Jenny McCarthy, Jim Carey and other celebrities with absolutely no scientific credentials. Pretend that doctors and scientists who are critical of vaccines – doctors like Dr. Suzanne Humphries, Dr. Robert Sears, Dr. Kenneth Stoller, Dr. Robert Rowen, Dr. Janet Levatin, Dr. Stephanie Cave, Dr. Sherri Tenpenny, Dr. Meryl Nass, Dr. Jay Gordon, Dr. Jane Orient, and many of the members of the Association of American Physicians and Surgeons, CDC researcher Dr. William Thompson, and all of the doctors and scientists listed here and here – don’t exist. Because really, if you don’t write about them, they don’t. 2. Always equate the views of the CDC, medical journals and pharmaceutical company spokespeople with “science.” Some people will try to tell you that science is a method, not a conclusion, that scientific truths cannot be determined by consensus or by appeal to authority, but you can just ignore them. “In my personal and scientifically backed opinion, the war against disease is a hundred fold more important than the mum-led war against vaccines. Do you want your child to die a slow, painful, agonizing death? If not, then shut the f*** up with your so called ‘facts’ you got from Yahoo Answers and get your kid vaccinated. In other words, if you don’t have the same training we do, you don’t get to be part of the discussion. Even when the topic of that discussion is whether or not we get to forcibly inject things into your bodies and the bodies of your children. Just shut up and trust the scientists. But not these scientists – they are all anti-science scientists. Only trust these ones. 3. Remind your readers that, however heart wrenching or tragic, anecdotal accounts are just that. They are not scientific, they don’t say anything about relative risk, and should play no role in influencing your opinion about vaccines. Until you want to tell them the heart wrenching story of how author Roald Dahl lost his daughter to measles, or about the death of a young girl from rotavirus that inspired Dr. Paul Offit to develop a vaccine for that disease. Anecdotal accounts of people suffering from vaccine-preventable illnesses are fine. Anything else though is just irrational. Take for example the thousands of stories from parents whose children were perfectly healthy until they received one or more vaccines and then suddenly lost the ability to speak, to walk, to feed themselves, or who started having seizures, stopped breathing or died. Many of the parents in these cases report that their doctors insist the vaccines had nothing to do with their child’s injury, even when no other explanation is apparent. Indeed, the vaccine manufacturers and the CDC insist that most such cases are simply coincidences and have nothing to do with the vaccines. But given the well-documented degree of conflict of interest and fraudulent practices within the CDC and the medical research community as a whole, many parents are understandably skeptical of such claims. To listen to the mainstream media, one would think that measles was a deadly affliction on a par with Ebola or the plague. Vaccine advocates distort the dangers of measles by pointing to adverse effects experienced by populations in underdeveloped countries, where even the mildest of diseases can be deadly due to things like poor nutrition and sanitation. It is also worth noting that the CDC’s statement that “(f)or every 1,000 children who get measles, one or two will die from it” relies on reported cases of measles. A more accurate estimate puts the death rate at closer to 1 out of 10,000 cases. Meanwhile, in the past ten years there have been only a handful of measles deaths in the US, but VAERS data report 109 deaths associated with the measles vaccine since January of 2004, and the US Court of Federal Claims has settled 111 claims related to harm from the MMR vaccine in that same time. Not only is measles a relatively benign illness for healthy people living in developed countries, contracting and surviving the disease confers benefits to the immune system – as well as strengthening herd immunity – in ways that vaccines cannot. “In the pre-vaccine era, when the natural measles virus infected the entire population, measles — ‘typically a benign childhood illness,’ as Clinical Pediatrics described it — was welcomed for providing lifetime immunity, thus avoiding dangerous adult infections. In today’s vaccine era, adults have accounted for one quarter to one half of measles cases; most of them involve pneumonia, one-quarter of them hospitalization. “Also importantly, measles during pregnancies have risen dangerously because expectant mothers no longer have lifetime immunity. Today’s vaccinated expectant mothers are at risk because the measles vaccine wanes with time and because it often fails to protect against measles. As discussed below, childhood illnesses like measles and mumps can help to develop the immune system in ways that help to protect against things like asthma, autoimmune disease and even cancer. So the proposition that eliminating measles – rather than simply reducing its deadliness – is a worthy public health goal is a questionable one. The reality is that there are legitimate and documented concerns about vaccine safety. Nobody denies this – all that is in dispute is the magnitude of the harm caused by vaccines. Vaccine manufacturers and their institutional supporters of course insist that any harm from vaccines is minuscule and easily outweighed by the benefits. However this claim is suspect for a number of reasons, not least of which is the stunning degree of conflict of interest and outright fraud within the world of medical research. Leaving aside these issues though, there remain good reasons to distrust the manufacturers’ claims. Studies that purport to demonstrate the safety of vaccines are similarly flawed and limited in their scope. Indeed, of the list of 42 studies put forward by the American Academy of Pediatrics, with an invitation to parents to “examine the evidence”, none compare vaccinated against unvaccinated populations, and most look only at either the MMR vaccine or at Thimerosal. And every year, around 30,000 reports are made to the Vaccine Adverse Events Reporting System (VAERS) which records adverse reactions immediately following vaccination, as reported by doctors, other medical professionals, pharmaceutical companies, patients and parents. Thirteen percent of these are classified as “serious” (including death). Of course these numbers don’t mean very much without a comparison to the background rate of such adverse events in the general population, not immediately following vaccination. Some studies have shown no increased adverse events after vaccination as compared to the general population. Other studies (including some that use post-vaccination data for other vaccines for comparison, rather than population-wide background rates) show higher rates of adverse events immediately post-vaccine. Vaccine proponents argue that the VAERS numbers are not an accurate reflection of vaccine damage, because each case reported has not been conclusively proven to be caused by a vaccine. It is a legitimate point – and is largely due to the fact that in most cases there is no way to confirm vaccination as the cause of the event. Indeed, one study found that while 68% of cases of vaccine-associated polio were reported, only 4% of MMR-associated thrombocytopenia were reported. An earlier study found that only 1% of adverse events following prescription drug use were reported. And in 1994, a survey found that only 18% of 159 doctors’ offices made reports when children suffered serious health problems following vaccination. In New York, this number was one out of 40. Some argue that adverse events are also over-reported to VAERS, presumably by distraught parents, but this charge is less credible. All the evidence shows that doctors and other healthcare providers are extremely reluctant to report events to VAERS. Healthcare providers account for 36% of all reports to VAERS, with vaccine manufacturers accounting for another 37%. Vaccine recipients and their parents or guardians account for only 7% of reports. “Measles helps a child’s immune system grow strong and mature. “Once past the immunologic barriers of skin and mucosa, our (2-trillion-cell) immune system has two components: An innate system, which all animals have; and an evolutionarily more recent adaptive system that vertebrates have. The childhood diseases—measles, mumps, rubella, and chickenpox—play a constructive role in the maturation of the adaptive immune system. Two kinds of helper T-cells (Th) manage this system:cellular T-cells (Th1); and humoral T-cells (Th2), which make antibodies. The Th1 cellular T-cells are especially important because they attack and kill cells in the body that run amok and become cancerous. And they also kill cells that become infected with viruses. There are no definitive explanations for these dramatic increases in potentially life-threatening conditions among children, and in all likelihood there is no single cause responsible for any one of them. However parents have good reason to be concerned about harmful environmental factors, including vaccines. Indeed, several studies show increased rates of immunological problems associated with vaccination. A study in New Zealand found a higher rate of asthma among those who had been vaccinated (Kemp et al, 1997); Data from the National Health and Nutrition Examination Study in the US showed that children vaccinated with DTP or Tetanus vaccines were twice as likely to develop asthma as unvaccinated children (Hurwitz and Morgenstern, 2000), and another study showed that the MMR vaccine can cause human white blood cells to develop IgE antibodies – one of the main characteristics of asthma (Imani and Kehoe, 2001). A 2008 study found that delaying DPT vaccination was associated with reduced risk of childhood asthma. Those who would force vaccinations on the rest of us are fond of repeating bromides like “your right to be sick ends where public health begins.” But who gets to decide what constitutes “public health”? Who decided that the eradication of every childhood illness is in the best interests of “public health”? Why are not increased rates of childhood cancer and life-threatening allergies relevant to “public health”? Why can I not demand that everyone else stop vaccinating their children because doing so directly threatens the ability of mine to contract childhood diseases which might help strengthen their immune systems? 6. If you must acknowledge that critics of vaccines have actual reasons for their concerns, restrict the discussion to the fear that vaccines may cause autism, and be sure to stress that the only basis for this concern is the retracted 1998 study by Andrew Wakefield. You can also mention some of the studies that “prove” there is no causal link between vaccines and autism. Just be sure not to mention any of the ones that do show a connection, like this one, this one or this one. Be especially careful not to mention this one, this one, or any of these, these or these. At all costs, never ever mention any of the concerns listed in “4.” above. You may have to repeat this last one many many times before your readers come to understand and accept it. 8. Don’t even address vaccines directly. Simply include some mention of vaccine skepticism as an example of the kind of irrational thinking some people (especially, strangely, well-educated ones) still engage in despite “everyone knowing” how foolish it is. This is perhaps the most powerful tool you can use to sway your audience. Nobody wants to be seen as foolish, and most people don’t have the time or inclination to look closely at the evidence for and against vaccine safety. If people keep hearing that “everyone knows” vaccines are safe and effective, most of them will tend to go along with that position even if they don’t know much about the topic – if only to avoid being seen as crackpots. Fear of public humiliation can be a beautiful thing in the right hands. 9. If the icky topic of conflict of interest or corruption of the research by vested interests comes up, just laugh it off. Remember: Writing in a derisive tone about other people’s claims or concerns is exactly the same as refuting them. Amy Wallace, who wrote this Wired piece handled this especially well. And not only did she fail to interview a single critic of vaccines for the article, she cunningly created the impression that she had included their views by visiting an Autism One conference and mentioning and briefly quoting – but never actually speaking with – NVIC president Barbara Loe Fisher. Well done Amy Wallace! Be sure to quote Dr. Paul Offit and to cite him as a “vaccine expert”. Don’t bother disclosing that he has made millions of dollars from the Rotavirus vaccine he developed. The whole notion of disclosing conflicts of interest within a story is so passé. Also anti-science. Vaccine advocates like to point to studies that show no increased risk of harm from vaccines. They assert that these studies invalidate the findings of other studies that do show a link between vaccines and asthma, allergies, autism and other conditions. In a world in which scientific institutions could be trusted to conduct honest, objective research and produce credible results, this might provide some comfort. In the real world though, there is little reason to give credence to much of the research that gets produced on vaccines – and much less so to results that in any way favor the manufacturers of those vaccines. Goldacre adds that “(a)dvertising is not the only source of drug company revenue for academic journals”, and cites “supplements” – special editions sponsored by drug companies – and reprints of individual academic papers that can bring in up to a million dollars each. And he cites a 2009 study demonstrating that industry-funded studies are more likely to be accepted by journals. 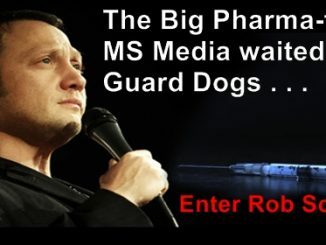 The real-world impact of this control has been well documented, from the FDA concealing fraud in medical trials, to built-in biases in studies, to pharmaceutical companies misleading practitioners as to the safety and efficacy of their products, to allegations of fraudulent misconduct brought by scientists turned whistleblowers. Put simply: The scientific establishment has lost any right to be taken at its word on this issue. Remind your readers of our long-treasured right to herd immunity: The right to demand – at gunpoint if necessary – that others take every possible precaution against contracting communicable diseases, regardless of the risks to themselves of doing so. This is a right our forefathers fought and died for and we’re not about to give it up now. Those who support imposing vaccines by force argue that those who do not vaccinate threaten herd immunity for the entire population. The idea that vaccines can successfully provide herd immunity is already questionable, as – unlike many childhood diseases – they do not confer lifetime immunity. Nor do they offer 100% immunity to those vaccinated. But more importantly this argument presumes that “herd immunity” is something anyone has a right to in the first place. For centuries, people have been aware that being out in public carries certain risks – among them, the risk that one might contract a disease from another person. Never before have people widely asserted that they have the right to demand that everyone around them take all possible precautions at whatever cost to themselves to make this environment absolutely risk free. If, as the mandatory vaccination proponents contend, we can demand that everyone around us take every conceivable precaution against every communicable disease, what else can we demand of them? For starters, the recently vaccinated (with live-virus vaccines) should be excluded from all public property. And if not, why not? They pose far more of a risk than does anyone who has simply not been vaccinated. What are some other risky practices Americans should no longer tolerate from each other? Going out in public with a cold? Being a poor driver? Being in possession of any substance that might cause a severe allergic reaction in someone else? How about superbugs? What are we going to do about all those people who abuse antibiotics, ultimately leading to the creation of superbugs. Antibiotic-resistant bacteria are responsible for nearly 15,000 deaths in the US each year, far outstripping pre-vaccine deaths for measles, mumps and whooping cough combined. Can we not hold the irresponsible people who take antibiotics every time they have a minor infection accountable for this? Personally, I avoid antibiotics for myself and my family as much as possible. I have never given them to a child with an ear infection (and yes, we’ve had some.) Should my preferences be imposed on everyone else? Doing so would clearly strike a blow against the propagation of superbugs. So why not? Here’s why not: Because your right to protect “public health” – whatever you think that may be given the interest-driven media hysteria of the moment – ends where my body begins. Herd immunity is not something anyone has a “right” to. It is a positive externality, and like other such externalities it is not something you have a right to demand that your fellow human beings provide for you. More to the point, you do not have a right to demand that other parents impose risks on their children that they are not comfortable with, in order to protect your child or anyone else’s children. Even in the case of a truly deadly illness like Ebola, there is no justification for forcing a particular method of prevention on those who have not contracted it, or forcing treatment on anyone who has. All that anyone has a right to do is demand that those people not infect others. It should be obvious by now that none of this would even be an issue if we lived in a society that honored self-ownership and private property. In the event of an outbreak of a truly dangerous disease – or even a disease that posed a serious risk to only a small segment of the population – each property owner could make their own decision about whether to exclude those who were infected or indeed, even those who chose not to be vaccinated against the disease, presuming there was a vaccine for it. Rather than having a one-size-fits-all solution imposed upon everyone by some authority, everyone would make choices based on their own perception of the risks. Businesses that responded to the risk sensitivities of their customers would do well and those that did not would suffer. And because not all people have the same perception of or sensitivity to the same risks, there would be a wide variety of choices: Schools that allow unvaccinated children and schools that do not; restaurants that cater to those with severe allergies and those that do not; parks, libraries, cinemas and other establishments that specialize in serving immunocompromised and other medically fragile individuals, and those that do not. In the absence of a “commons” – property that is used by everyone but owned by no-one (or, more realistically, owned by the state) there would be no calls for anyone to have vaccines forced upon them at gunpoint. Those who believe vaccinations are absolutely necessary would frequent businesses and venues that enforced strict vaccination policies, and those who did not would frequent places that had more relaxed policies. My own guess is that for the most part, the issue would simply go away. People would come to realize that the real risk to themselves and their families posed by those who do not vaccinate is in fact minuscule – particularly in comparison to other risks we all expose ourselves to daily. In the absence of a “commons” managed by people who do not have to earn the costs of their operation, most business owners would find that they stood to lose more by excluding “non-vaxxers” than they did to gain by allowing them in. It is only in a world where property rights are not clearly defined, where there are great swathes of “commons” (either “public” property or nominally private property over which owners do not have genuine decision-making powers) that there can be a conflict between “public” health and individual rights. Eliminate the commons and you eliminate that conflict – replacing it with a myriad of voluntary solutions to meet the differing wants and needs of diverse individuals. Do those who believe in mandated vaccination really want to establish the precedent of granting a government body the power to compel people to be injected with substances against their will? You may support the forced vaccination of other people’s children because you think vaccines are undeniably beneficial and problem-free. But you may not be so thrilled about the next substance the state decides everyone should have forced into their veins. Do you really want to establish the precedent of being able to demand from your neighbors that they pose no risk to you at all? The corollary of course being that they may then demand the same of you? If as a society we decide that we have the right to demand a 100% risk-free environment in which to live then the potential intrusions into our lives are infinite. Even if the manufacturers’ claims are correct and the risk of serious injury from vaccines is infinitesimal, for most people it is impossible to know ahead of time whether or not they will be injured by a vaccine. Nobody has the right to force another person to choose that risk – however small it may be – over the risks of the diseases the vaccines are intended to prevent. The state already controls vast swathes of what we can do with our lives: What professions we may enter, how and where we may conduct business, what substances we cannot ingest, how much of the money we earn we are allowed to keep, how we may travel and what indignities we must tolerate in order to do so, when and where we may protest, and the list goes on and on. If you do not believe that individuals have the right to control what goes into their own bodies then I have to wonder what rights – if any – you do believe people still have. It seems to me that, save choosing our mates for us, the last remnant of our self ownership lies in our right not to be directly assaulted, not to have unwanted drugs or other substances forced into our bodies. If you believe that the state has the right to do this, then there is essentially nothing left that it does not have a right to do. The pro-vaccine lobby has done a phenomenal job of inciting fear among the American public in a way that happens to serve its interests: Fear of little children who may not have been vaccinated; fear of other parents who may make choices different from yours; fear of a disease that in the developed world is far less deadly than lightning strikes. But they’ve left out one of the most frightening specters of all, one that has a truly horrifying historical record of death and destruction: An all-powerful state that can literally do whatever it wishes to those living under it. If that prospect frightens you less than the remote possibility that you might contract measles from my five year old, then quite frankly you scare the hell out of me. Bretigne Shaffer [send her mail] was a journalist in Asia for many years. She is the author of Urban Yogini (A Superhero Who Can’t Use Violence) and Why Mommy Loves the State. She blogs at www.bretigne.com. TLB recommends you visit LewRockwell.com for more pertinent articles and information.